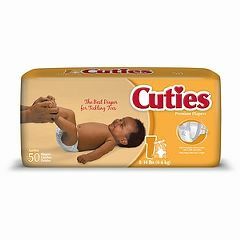 Cuties® Baby Diapers from First Quality are a super absorbent baby diaper for girls and boys. Size 1 diapers are for babies 8 lbs to 12 lbs. Size 2 diapers are for babies 12 lbs to 14 lbs. Size 3 diapers are for babies 16 lbs to 28 lbs. Cuties combine great performance, design, construction, fit comfort into each diaper. Soft Stretchy Waist and Side Panels move with your baby to help prevent leaks. Cottony Soft materials surround your baby in comfort. Cuties Soft & Gentle Hypoallergenic Liner delivers botanicals like Aloe, Chamomile and Vitamin E to help soothe your baby's skin. Each Cuties Diaper is printed with an Animal Alphabet graphics system to inspire creativity and learning at each and every stage. Each diaper is clearly marked with the size on the center of the back. All products are proudly made in the USA. I am a retailer of baby products. I need suppliers of baby diapers, wipers, etc. 1) How do I buy wholesale? 2) Does pack of 200 mean 200 packets or one packet with 200 pieces in?